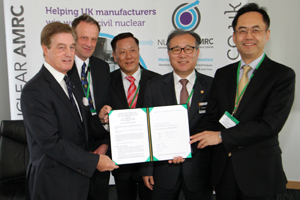 Trade delegates from South Korea signed Memorandums of Understanding with the University of Sheffield and the Sheffield City Region Local Enterprise Partnership (LEP) on a recent visit to the Advanced Manufacturing Park (AMP) in Rotherham. 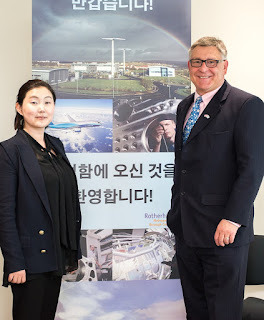 The visit was the first time a business delegation led by a representative of the South Korean government has visited a British region outside London. The 30-strong group was in Rotherham and Sheffield and led by Mr Han Junghwa, who heads the Republic of Korea's (RoK) Small and Medium Business Administration, a government department with a £4.7bn budget. Delegates held meetings with representatives of local government, business and academia in the Knowledge Transfer Centre at the University of Sheffield Advanced Manufacturing Research Centre (AMRC) with Boeing, before visiting the Nuclear AMRC, where they signed Memorandums of Understanding with the University of Sheffield and the Sheffield City Region Local Enterprise Partnership. They then toured the Factory of the Future and the Composite Centre, also on the AMP. Professor Sir Keith Burnett, vice chancellor at the University of Sheffield, said: "We greatly admire the manufacturing prowess of Korea. It has done the most extraordinary and wonderful things across a whole range of activities. We believe we have here something to offer to your Korean colleagues. We would love to be your partners in the next generation of products." Jounghwan Lee from the AMRC Composite Centre played a key role in helping to facilitate the visit which was conceived and delivered by INKE, the International Network of Korean Entrepreneurs – with 1,500 member companies in 49 countries worldwide – and the Rotherham-based chairman of its UK chapter, Dabriel Choi. Andrew Denniff, chief executive at Barnsley and Rotherham Chamber of Commerce met with the delegation at the AMP (pictured, right). He said: "This is exactly the type of visit from overseas businesses that we should be hosting and encouraging more of in the future. The reputation of the Advanced Manufacturing Park at Waverley in Rotherham is spreading worldwide and we should not shrink back from using that as an attraction to bring foreign investment into the region. "The kind of organisations and businesses that want to come and talk to us with a view to doing business across South Yorkshire is increasing. The opportunities for inward investment into the "Sheffield-Rotherham" corridor over the next few years has to welcomed and supported, whilst not forgetting the potential for our own local businesses to benefit from an increase in supply chain engagement and the chances for trading into new foreign markets."